Managing your candidate attraction channels effectively is crucial to any recruitment business. Whether it's your Website, job boards, word of mouth or a black book of names, businesses need control of their inbound candidate methods. Social Media has been one channel, which over the last few years has become a hot topic. In this post, we have listed some of the best (non mainstream) Social Media tools for recruiters to use and the benefits of using them. We will tackle tips and tricks of the bigger social platforms over the coming weeks (Facebook, Twitter, YouTube, Instagram etc) but for now, these are some amazing tools you may want to spend time considering. One of the best kept tools on the Internet, Buzzsumo will stop writers block. 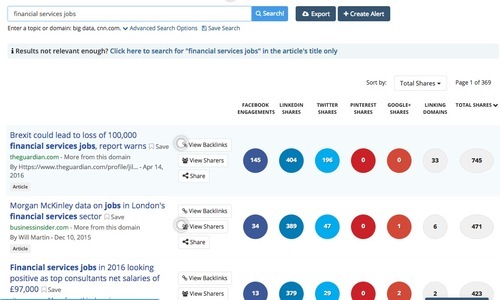 The tool itself shows the best performing content of a particular topic or keyword over the past 12 months. This means you can put your clients or competitors Website into the tool and it will show you (by channel) which content picked up the most engagement. It also does this on a topic by topic level. I received topics such as Brexit, Morgan McKinley data and Salary advice. All of these have thousands of social shares, so indicate that both the content and topic are newsworthy. Buffer (famed in part for advertising their employees wages online), is a web-based Social Media management (SMM) app. Buffer makes it easy for you to spread content across social media platforms. You upload your updates/content to the buffer app and then schedule it to be published to your social channels. You can share Video, Copy and can actually create your own content using a tool called Pablo. The really smart part, is that the app continues to reschedule content, based on the best times of day for that particular content to be read, which maximises the chance that your tweets and posts will hit the intended audience. It integrates with Facebook, Twitter, Pinterest, LinkedIn, Google+ and Instagram. The tool has a 14 day free trial with prices from $99 USD per month. Who should use it: Recruiters looking to generate 'client' leads through Social or increase their social engagement. Before Zoomph was Topsy, a twitter owned Analytic tool. The service was free and ultimately discontinued in 2015. Analyse - Compare, measure benchmark and track your performance. BuzzStream is one of the most popular Social Media tools for marketing agencies. It shares some similarities with Zoomph in terms of influencer management, but is (in my opinion) a more specialist tool at that area. The tool itself is a hybrid of a SMM tool and a CRM (database) system. You can add bloggers, influencers and Website into the tool from your browser (It has plugins for Chrome, Firefox, IE), then turn these influencers into prospecting lists to contact to distribute your own content through. I like to think of BuzzStream as a Marketing-level-CRM, in a similar way that Salesforce or Hubspot are Sales-level-CRM's. It's perfect for outreach marketing and also generating client level leads (b2b) through Social. Edgar (MeetEdgar to some) is a specialist Social content and categorising platform. It's algorithm is aimed at constantly recycling your best content, so that your Website views from Social never drop off. Unlike other scheduling tools, it allows you to categorise your content into categories and then schedule those categories to a calendar (rather than individual posts). This is a great way to find which types of content are working best for you and Edgar then picks the best of the best to keep relevant traffic coming to your Website. One of my favourite things about Edgar is that you never run out of content; as soon as your new content has been posted, Edgar reposts the best of the rest. Pricing is £49 USD per month. Sendible is another 360 SMM tool, which is packed (literally) full of features. The core product has social posting, analytics, content delivery and CRM capabilities, making it a great all-round tool. It's aimed at companies who are serious about taking control of their Social visibility and their social lead generation. It also benefits from a number of great team features, allowing for collaboration easily. Sendible is used by a lot of Digital Marketing agencies who are managing multiple client accounts at the same time, which is reflected in the customisable nature of its reporting and mutli-profile management.